On the bank of the Calumet River, a few blocks away from the Indiana border and Chicago’s historic Calumet Fisheries, is a land that speaks of another time. An industrial bridge, the section of the ten-year-old Chicago Skyway that stretches across the river, sits high above the water. Docked on the riverbank are ice- and snow-crusted tugboats and barges, one dating back to the 1940s. Stepping inside one of these tugs feels like stepping into the gritty, unrefurbished version of a wartime sea vehicle at a history museum: the captain’s cabin reeks of tobacco, the kitchen is arranged like a breakfast-all-day diner, andthe measly twin bunks are left unmade as if waiting to continue a moment frozen fifty years ago. It could very well be one such abandoned relic were it not for the two unassuming trailers that sit a few feet away from the dock. These trailers, tugs, and barges belong to barge enthusiast Jacqueline Kindra and her husband John. Black Diamond Marine, a small offshoot of the Kindras’ less specialized companies like Kindra-Lake Towing, occupies half of one of these trailers. Black Diamond specializes in niche deals, like providing decked barges for city-sponsored fireworks shows or putting a golfing surface on the Chicago River for golfers atop skyscrapers in the Loop. The Kindras started investing in the Chicago barge industry in 1983, but when Jacqueline saw untapped potential, noticing that “really weird people” wanted barges for “really weird things” and that no one was there to give it to them, she created Black Diamond. 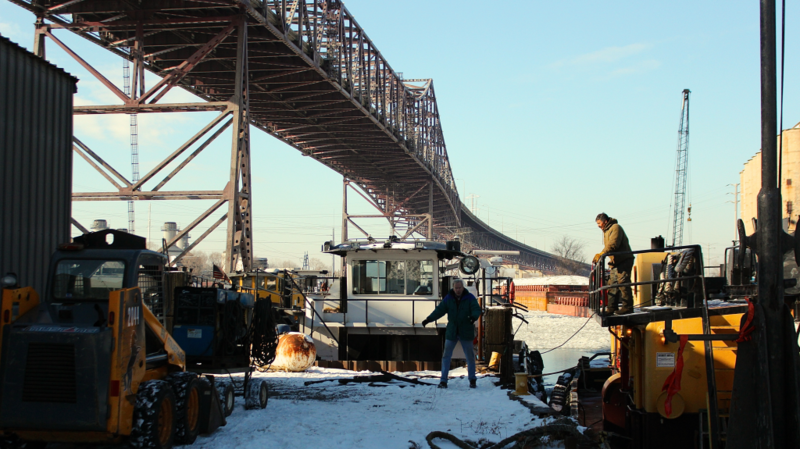 Black Diamond and its sister companies also deal with the structural aspects of the city, providing marine equipment for bridge inspections, construction, and the cross-country transportation of raw factory and construction materials. The Kindras consider the barge trade a secret and secluded industry, made up of “lunch-pail workdays” and thirty-day “live-aboards” on the water; these days reveal the city’s barely-kept secret—a gritty, industrial Chicago, one that isn’t just of the past. On the bank of the Calumet River, a few blocks away from Indiana, among expanses of ice and smoke stacks billowing in the air, the quiet backbone of the city does its duty.